Today [11 November 2018] is Remembrance Day, marking the centenary of Armistice Day and the day World War I came to end 100 years ago on 11 November 1914. Later this morning, there will be one service of commemoration for the Rathkeale and Kilnaughtin Group of Parishes, with a Remembrance Sunday service in Holy Trinity Church, Rathkeale, Co Limerick, that begins with the Act of Remembrance and that concludes with a celebration of the Parish Eucharist. Throughout these islands, throughout this day, names will be read, wreaths will laid, bugles will be blown, silence will be kept for a minute, and poppies will be worn – but also looked on in scorn with silences accompanied by deep in-takes of breath sucked through clenched teeth. I am a pacifist, and have been all my adult life. So, you may ask, why am I wearing a poppy today, and why I have been wearing one for the past week or so? Let me share two examples of why I think it is important to continue marking Remembrance Day, and why I think we should be asking some questions as we mark the centenary of the end of World War I. My first example is the story of my own grandfather. Stephen Edward Comerford was hardly a young man when he signed up with the Royal Dublin Fusiliers in 1915. He had already been widowed and had seen the tragic death of his eldest child, Edmond Comerford. 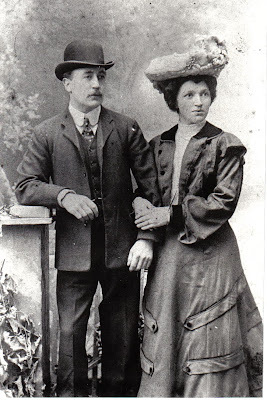 When he left Dublin for Gallipoli in 1915, he was a 47-year-old man, leaving behind in Ranelagh his second wife, my grandmother – they were married just 10 years earlier – and her five young children and step-children. Perhaps he knew he was helping his own country and the smaller nations of Europe; perhaps he hoped for a better job not only for himself, but for his children too when they grew up. Either way, he knew he was doing the right thing – for his country, and for his people – when he joined the Royal Dublin Fusiliers – ‘the Toffs and the Toughs’ – in 1915. Within days, he was sent to the Greek island of Lemnos and on to Gallipoli and Suvla Bay. He was among the few survivors evacuated to the Greek city of Thessaloniki. But in the severe Greek winter, many of those soldiers suffered frostbite, dysentery and other sicknesses. Then, in the summer’s heat of 1916, more of them came down with malaria and were evacuated from Thessaloniki. When I visit Thessaloniki, most recently during Easter week this year, and walk through its streets and climb its hills, I imagine how he must have watched his comrades die from the wounds they received in Balkan battles, from the bitter cold of winter and from the frostbite – many of them young enough to be his sons – while his wife and children wondered whether they were ever going to see him again. As I stop at a church here or a monastery there, looking out over the Bay of Thessaloniki, I imagine the prayers he prayed, hoping he would return alive to his wife and children in Ranelagh and to her family in by the sea at Portrane. Stephen Comerford was discharged on 3 May 1916, three days after the Easter Rising ended in 1916, and was sent back to Dublin. His malaria was life-threatening but life-saving – for a few months at least. The war ended on 11 November 1918 and a month later, on 14 December 1918, his youngest child – my father, also Stephen Edward Comerford – was born in Rathmines. Later, Stephen was decorated with the three standard World War I medals – the Victory Medal, the British Medal and the 1914-1915 Star. But his health continued to deteriorate, no more children were born, and he died alone in hospital at the age of 53. My father was the only one of my grandfather’s seven children to have children himself. So malaria saved my grandfather’s life, however briefly, and ensured that he had grandchildren. He died just two years after my father was born, and he was buried in the old Church of Ireland churchyard in Portrane, close to my grandmother’s parents. But the inscription on his gravestone makes no mention of his part in the Royal Dublin Fusiliers, or of how he died. Ironically, the gravestone also gives the wrong age for him at the time of his death. Stephen Comerford was born on 28 December 1867, and died on 21 January 1921 at the age of 53. But the gravestone says he died at the age of 49 – the age he was when he came back from the war in 1916. As his health deteriorated, he must have remained 49 for ever in my grandmother’s heart. My grandfather’s only reward was those three war medals – but even these were lost in the various family moves between Ranelagh, Rathmines, Terenure and Rathfarnham. His lonely hospital death was filled with sadness, terror and dread. His story typifies how those soldiers were forgotten by those who sent them to war and how their stories were not handed on in their families, fearful they would be marginalised further as the political climate changed on this island. In Ireland, my grandfather remained 49 for ever in my grandmother’s heart. And there is some corner in Thessaloniki that is for ever Ireland. In the centenary of commemorations we are marking during this decade, the contribution of men like my grandfather must not be undervalued, still less forgotten. My second example comes from a train station I know well in the English Midlands. 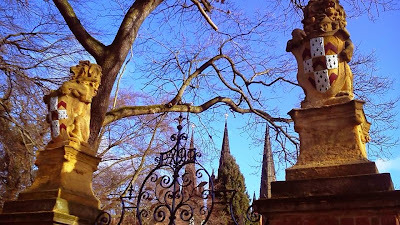 A significant part of my life-story is linked to the cathedral city of Lichfield. And regularly, as I arrive or catch a train at Lichfield City station, my eye is caught by a poppy wreath hanging on a monument to a teenage soldier who was shot dead in the station in 1990. 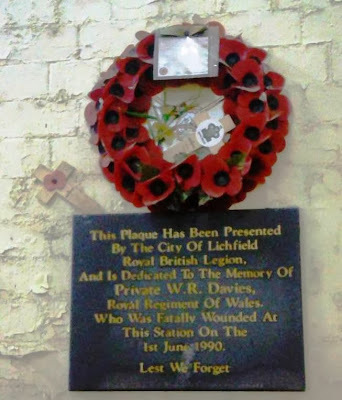 Private Robert Davies was off-duty and only 19 when he was shot dead by the IRA on 1 June 1990, waiting for a train home to his parents in Wales. He had been a soldier for only 12 weeks<, he had never shot anyone, he had never been to war, and his murderers have never been brought to justice. Robert Davies would be 47 today – the age my grandfather was when he went to war. Unlike, my grandfather, though, he never returned home. He has no children or grandchildren – he is remembered by his sister and his parents, still grieving a young man murdered by terrorists who had the gall to take life, to murder, to create grief, all in the name of this country, and in the name of all who live on this island. ● A hundred years on, what does World War I mean for humanity’s self-understanding, for Europe and its place in the world and our understanding of God? ● Are the centenaries of 2014-2018 celebrating or commemorating? ● What is our purpose and message and what place do penitence and reconciliation have? World War I is beyond the memory of all of us, but we all live with its consequences. For that war led eventually to the monster that became Nazi Germany and to the Holocaust; it tore apart the Balkans in a way that continues to create suffering from Bosnia to Bucharest, for refugees, Romanies and other minorities across Europe; and it contributed to too many problems we still face in the Middle East with the drawing of artificial boundaries and the creation of artificial states. ● Hearing the stories from people of all sides of the conflict. ● Writing and using prayers that do justice to all the feelings that are going to arise. ● Examining the lessons we should continue to learn today. ● Remembering key Christian witnesses and heroes. Not all of them are men, as the monument to the women of World War II in Whitehall in London reminds us. Not all of them are soldiers, as in the case of Nurse Edith Cavell, or the brave people who went against popular culture and declared themselves conscientious objectors. They include doctors and medics with the Royal Army Medical Corps. They include non-combatants of every age and generation whose cities, towns, villages and farms were destroyed. ● And, finally, praying for forgiveness, healing and peace. I am a pacifist, but I willingly wear a poppy today, if only to say that my grandfather and men like him should never have been neglected, and their sad stories should never be forgotten, nor the sad stories of the widows and children they left behind. I wear it today if only to say that the murderers of 19-year-old Robert Davies in Lichfield should not have the last word about the value of a young man’s life, nor about what it is to be Irish today. I wear it today to say that we must find the ways needed to put all wars behind us, to put aside all hatred and violence, to say that when we remember that we must remember with sorrow, with gratitude and with forgiveness, but without bitterness or anger. I wear it today to say that the call of nationalist ideologies must never twist us, must never distort the love we should have for others, and must never allow us to deny our shared humanity. and to all us sinners Eternal Life, Amen. This posting includes material in a sermon preached at the Remembrance Day Service in Holy Trinity Church, Rathkeale, on 12 November 2017 and a sermon preached at the Remembrance Day Service on 10 November 2013 in the Chapel of the King’s Hospital, Dublin. So thought provoking Patrick. Thank you.